Question 1: Why not use Quaternions for camera? - or if you have, it is not working properly. Question 2: Where is this going? Do you have an end game? Also, super sonic can get me off the map fyi. @Zeke Yeah, the camera is a bit fragile at the moment. I might look into it and redo the code. No end game at the moment as this just started off as a simple example for simplex noise. If you have any suggestions, I would love to hear them! I fixed the supersonic problem, but it won't be in the jar until the next release. Sorry about no developments for a while. School is brutal now and the huge increase in homework has left me no time to work on anything. I plan on trying to make time in the near future to work on this project some more. I have a minor bug fix that I haven't uploaded yet, but nothing major. I hope to be able to start this up again very soon. 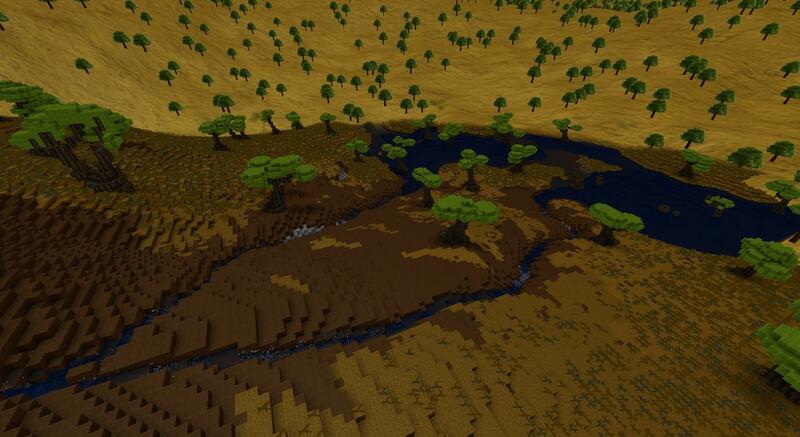 You should get back to this when you have spare time, nice hill generation. How flexible is it? Are you able to control the height easily? Never done this before, interesting to know how flexible a simple implementation of this is. I am using simplex noise to generate. I don't really know where I got this code from but it works perfectly. Using these classes, I can easily generate a series of points, which are later used to create a mesh. // This is used to just create larger features. // Stores a 2D array of points using the simplex noise. // Mesh generation goes here. May I suggest adding some texture filtering? It doesn't really look like you're trying to go for pixel-art, so I figured it may help. When looking down at the terrain, you can see the pixelation. Yeah, you're right. This is also a problem with the text so I'm going to have to work on it. I've tried to download the latest version and run it on my Mac through Terminal. It launches the JVM and then quits without printing anything to console. EDIT 2: According to Intel's website my chip (HD Graphics 5000) has OpenGL 4 support. Hope this helps. Here's a little progress update to keep this project alive. 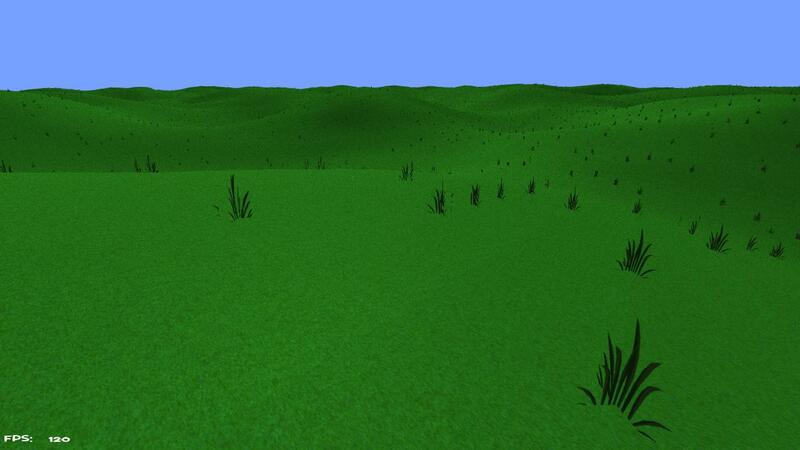 Grass is now a model, and as you can see, performance has decreased severely. 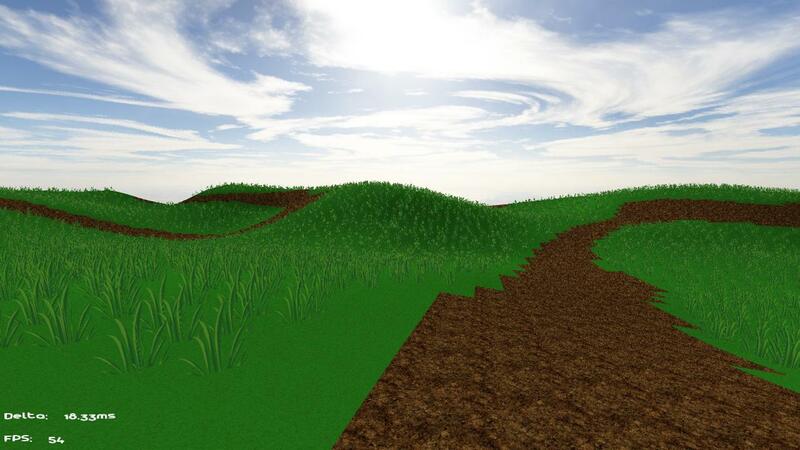 I implemented a rough LOD which helps boost it a little bit, but I am still not happy with the grass. I am considering just using an image that always faces the player. As always, suggestions and criticism are welcome! @kpars Done! The game now supports all types of filtering. I am currently using GL_LINEAR for most things. @Coldstream24 It seems that your graphics card does not want to use OpenGL V4 for some reason. I tried core profiling to 3.2 to try to force the version selection but it seems that glDrawElements gives an error?! I will investigate into this more. I am considering just using an image that always faces the player. Those are called billboarded sprites, and that's not too bad of an idea. First off, Do you plan to add mipmapping and a lighting engine in the future? Second, What license is the source code under, did you put it on Git? I'd love to tinker around with this! Grass is now a model, and as you can see, performance has decreased severely. Could you only render grass when it's at a certain distance? Have it just fade in? Yes, Both are planned. There is already basic face lighting implemented, but I want to implement shadows. The code is licensed under the Apache 2.0 license. I will soon add the license as a header to every file. The code is on Git, check my signature and feel free to mess around with it! 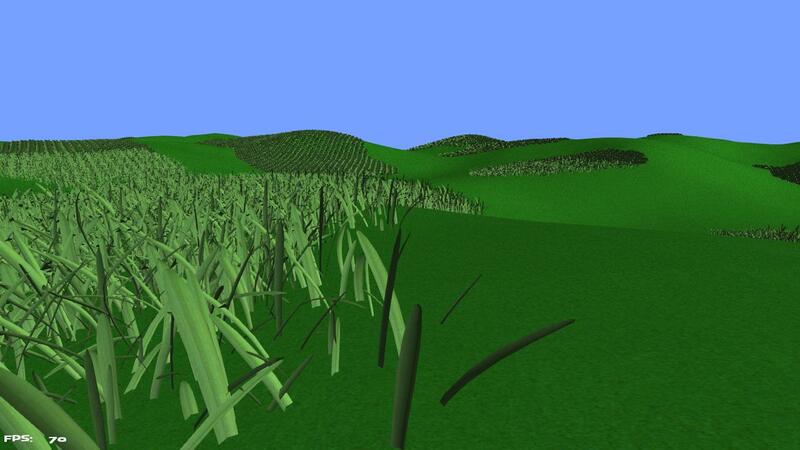 The grass is only rendered as a model to a certain distance, then it renders as a flat texture. The model itself is way too high a resolution for more than a couple of patches away, and is dropping the performance quite a bit as a result. Are you referring to fading in as like a fog? This is on the list of features to be implemented, I just need to do some research on it. Yes, I am. It's an older version (before all the re-factoring) that I've modified to either expand functionality or increase usability. Edit: There's a link in the README for anyone who wishes to use/view the most current version of the engine. Are you referring to fading in as like a fog? 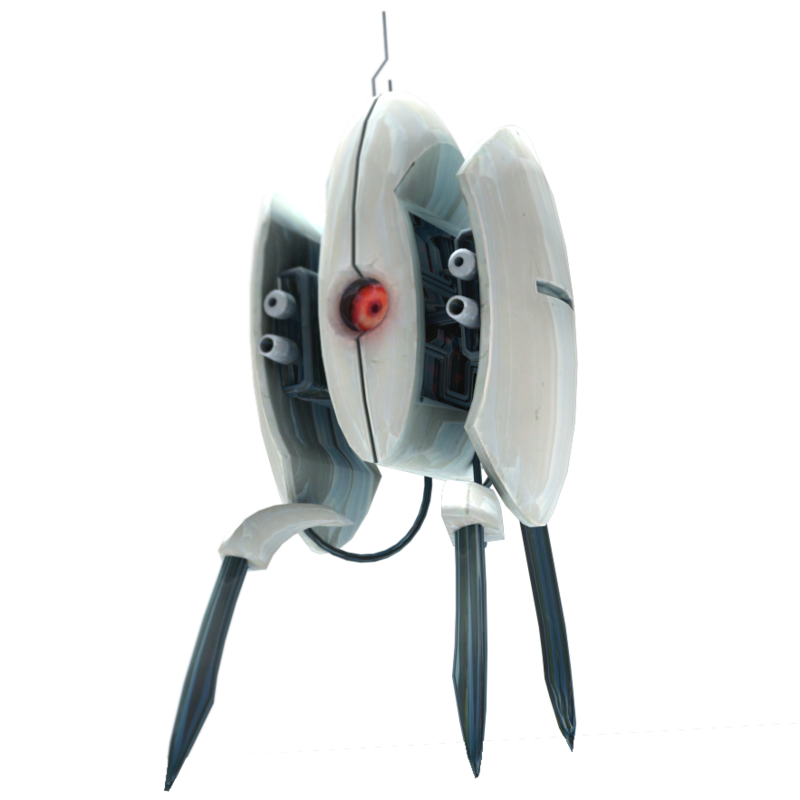 Kind of… ever played Half-Life 2? More specifically, the sections on the airboat? I'm just remembering back to that how certain world objects (like grass) would just fade in when you got a certain distance away from them. I'm not talking fog as a whole, but that'd work too I guess. I think I understand what you mean now. You're referring to like how the cubes fade in? Ooh Seed of Andromeda ! Very nice project you have going on here! Inspired by The Fog - Survive, State of Fortune, Far Sky, and many others, I have created a 3d randomly generated world using simplex noise in a couple days. I have been working on refactoring the code and optimizations. I have completely redone the game loop, as well as many other things with hope for multi-threading support very soon! The game no longer crashes and burns whenever it generates new terrain so I guess that's progress to better and more exciting things! Edit: I completely forgot! I fixed the camera so that it doesn't glitch everywhere. Wow, it's looking great now. What kind of computer are you running it on to be getting 54 FPS? Also, I'm interested to hear what plans you have for this in the future, I think it has quite a lot of potential. You will definitely want to check out this blog post by one of the guys who worked on Titan Quest. 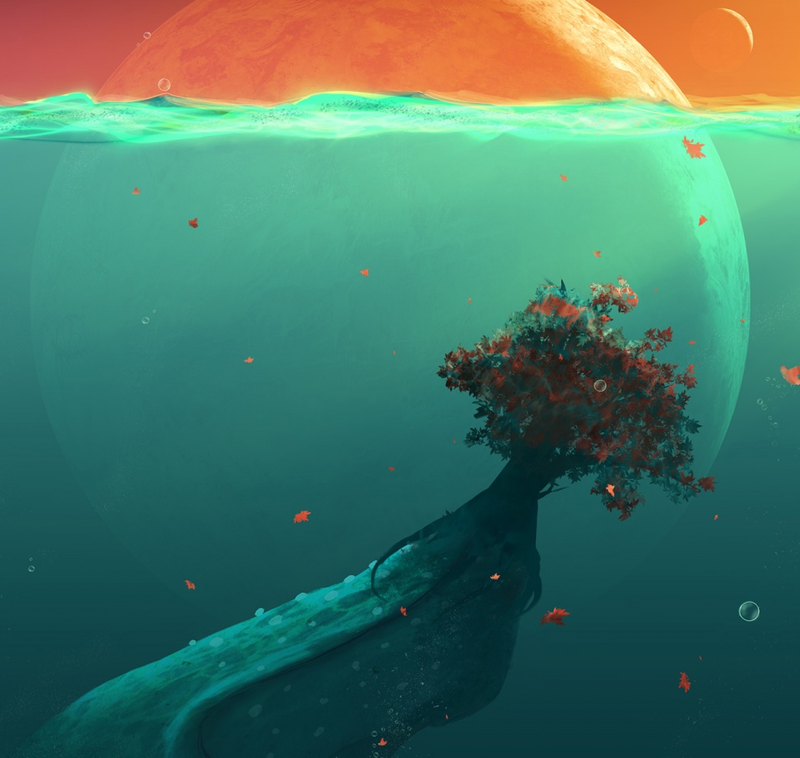 It describes very nice looking texture blending, it is very cool. Thanks. I am running on an i7 3770 and GTX 660. If I can barely get this on my machine, then some serious optimizations are needed. I plan on implementing frustum culling as soon as I figure out a good method. I am also planning to implement connected textures for things like the roads. Feel free to leave a suggestion on what I could add. I assume that you are referring to the border between the road and grass? Thank you for the article, it's an interesting concept. I will probably add it if I'm not happy with the connected textures.